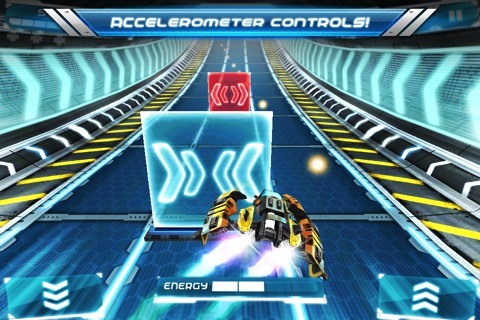 Ion Racer is a sweet and edgy racing game for iPhone and iPad and sells for $0.99 in the App Store. I’m not typically one for racing apps, but the art of Ion Racer from SGN really drew me in. Once I downloaded it onto my iPod touch, I quickly felt absorbed by the amazing feel and high tech atmosphere of everything in this application, from its menus to the various arenas in the game. The level of customization that is available in the Ion Racer iPhone app is astounding and in my opinion only paralleled by few others. It is almost impossible to grow bored of this iPhone game since as a play you truly never play the exact same level twice. Because of how versatile the gameplay is, each race truly provides a different experience. The concept behind this application is unique in that it really tailors towards gamers who are planning to play this game for a long time and has its own gaming style. The easy-access touch controls make gameplay smooth and simple, allowing you to focus on the race rather than the mechanics of the experience. The in-game currency of Kions is very effective in encouraging continued gameplay and racing from the players in order to constantly improve and morph the level of racing. I love the aspect of repairing since it adds another challenging aspect to the experience and character building, rather than keeping it a mindless race about turning left and right. The multiplayer aspect in Ion Racer will help keep players engaged longer and inspire friends to go head to head, giving them a chance to boost their score. The audio in Ion Racer is intense and invigorating. It serves to further enhance the gaming and racing experience both through the epic background music as well as the sweet sound effects. The system of upgrades is somewhat harsh and demanding but not without guaranteed satisfaction and reward–the hardest part is actually making the decision of what upgrades to choose. The hyperspace type format and feel of the racing arenas is really awesome, although the elaborate lighting can be sometimes distracting. Worth mentioning: My friend had this app downloaded on his iPad, and the graphics definitely did not look as sharp on there, although it looks great on my iPhone and iPod touch. I hope they increase the resolution support in the next release. Overall, I think that Ion Racer is an amazing piece of work by its developers, and I hope that this review encourages the Social Gaming Network to keep updating this application. For the length of time I have ended up playing this game, I would definitely say this application is worthwhile downloading. I can see myself continuing to play this racing experience for many more hours, improving my ship and beating challenge after challenge that Ion Racer never fails to provide. 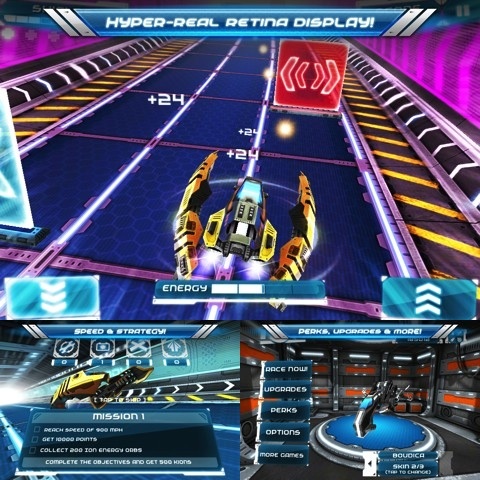 AppSafari review of Ion Racer was written by Darius Reimm on April 18th, 2012 and categorized under App Store, Games, iPad apps, Racing, Universal. Page viewed 3858 times, 1 so far today. Need help on using these apps? Please read the Help Page.